What factors influence the price of a second hand car? There are many factors that will influence the buyer when purchasing a second hand car; age, model, make, colour, style, fuel, mot and condition to name a few. Age: I think age will be a major factor because older cars are generally not as popular as their newer counter parts, and an older car will probably have more problems than a younger model. Mileage: I think mileage will be a major factor because a high mileage means a car has been driven a lot making the engine less efficient and may mean the car will be high maintenance. 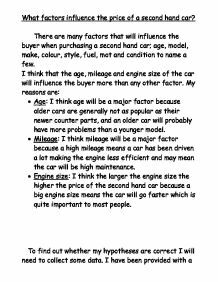 Engine size: I think the larger the engine size the higher the price of the second hand car because a big engine size means the car will go faster which is quite important to most people. To find out whether my hypotheses are correct I will need to collect some data. I have been provided with a data base of 100 cars. I will not use all 100 cars as this is too much data for me to work with. [You should try and explain why you think these may be, and also why has the equation of the line of best fit been put in? describe how this can be used]. 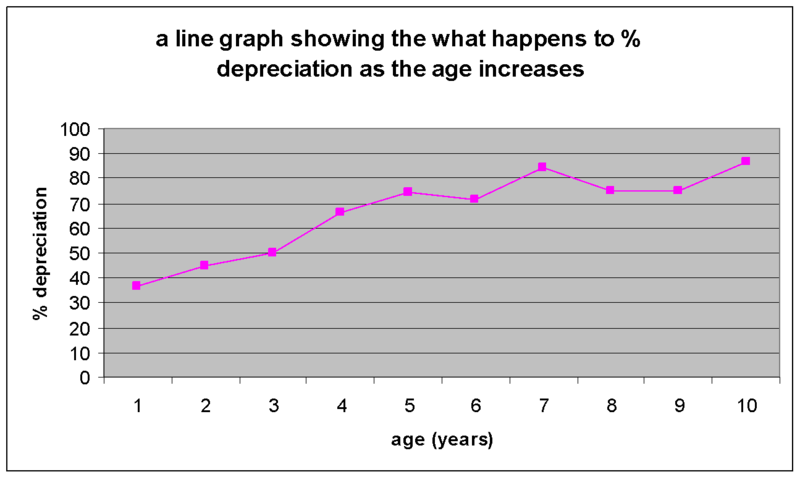 The scatter diagram also shows me that the depreciation varies a lot for an age, e.g. for a car 6 years old there are about 8 different % depreciation values and the same % depreciation value holds for cars 3,4,5,6 and 7 years old. So I do not think the scatter diagram is the best way to find out if age truly affects the depreciation of a car. I will instead work out the average percentage depreciation rate for different ages and see if there is a trend in this. can't find the mode for the mileage and price because they are all different. Both the mean and median year is 2004 if the mean is rounded off. The price mean and median is quite close together with around a 300 difference. 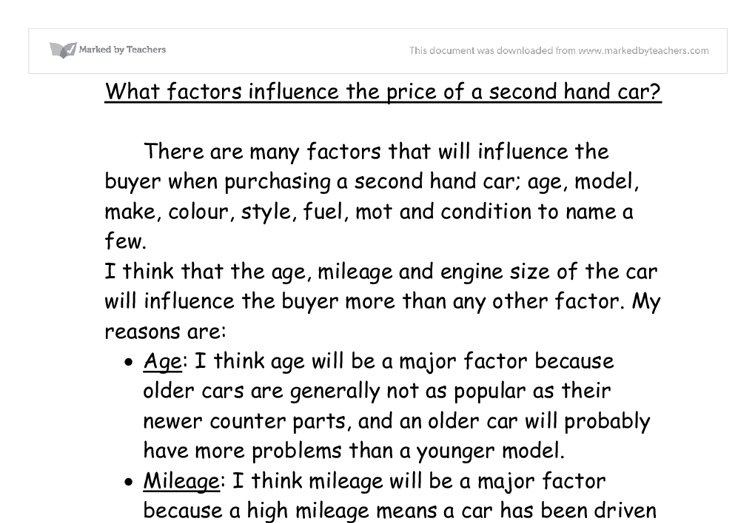 Statistic coursework-what has the most influence on the price of a second hand car? the size of the engine, the less expensive the car will be as less petrol would be needed. Colour: Colours differ in Middle Eastern countries. If the colour of a car is 'white' it is known to be quite costly. * Random sample: In a random sample, every member of the population has an equal chance of being selected. Random samples need to be carefully chosen. There are three ways to proceed random sampling and they are... * Method 1: Each number is written on a piece of paper. Evidence, which suggests this, is that both the cars from Fiat and Ford have had a considerable amount of percentage loss in value. The difference of percentage loss between the youngest Ford car and the oldest is about 36% and for the Fiat car it is 40%.